This ebook provides an entirely different approach to entertaining children. Original material and suggestions - "bread and butter" information by an experienced performer. 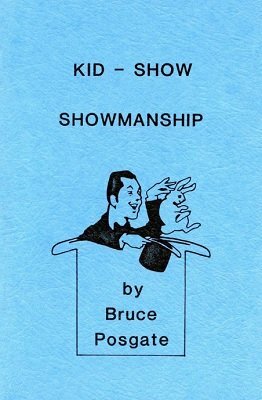 This volume explains the psychology and know-how of working children's shows. Entertaining children is a profitable business. Depressions may come and go; movies, television and other diversions can come and go ... but children are in constant supply. One generation after another as your potential audience. Only an experienced performer could write a book of this kind. No theories, but facts and tested procedures, invaluable when put into practice. If you are "afraid" of working kid shows, this ebook will change your outlook and you will soon profit from them. The material in this work will guide you as to what to wear, how to plan your program, how to choose assistants from the audience, how to open the show, how to close the show and how to handle repeat engagements. It tells you what to say and what not to say and even gives sound advice on how to sell your act. 1st edition 1961, PDF 35 pages.